haha, yeah, much friendlier than a steel bar to anything you are pushing on, if you happen to care about what your pushing on. need to try and get some stuff done to that before I move out to lake havasu. but quads do. I jumped a 250 quadracer into a canal in high school. and there is enough desert on the opposite side of town from the lake. Just gotta get it running right. and Desert bar is great fun. haha, the type of 19 year old that knows better it sounds like. I have lots of family to help me out, and my mom is retired, so she is flexible. helps a lot. Havasu on holiday weekends can get a little out of hand. Been there and will avoid them also. Good call Nuke. Wow has it been a long time since I updated this. But she was puring tonight. Not dropping down to idle, might be a kinked linkage, or needing a longer throttle cable. Gonna mess with that tomorrow. no leaks, no worthwhile blowby, and sure sounded nice with that supertrap, not even too loud. 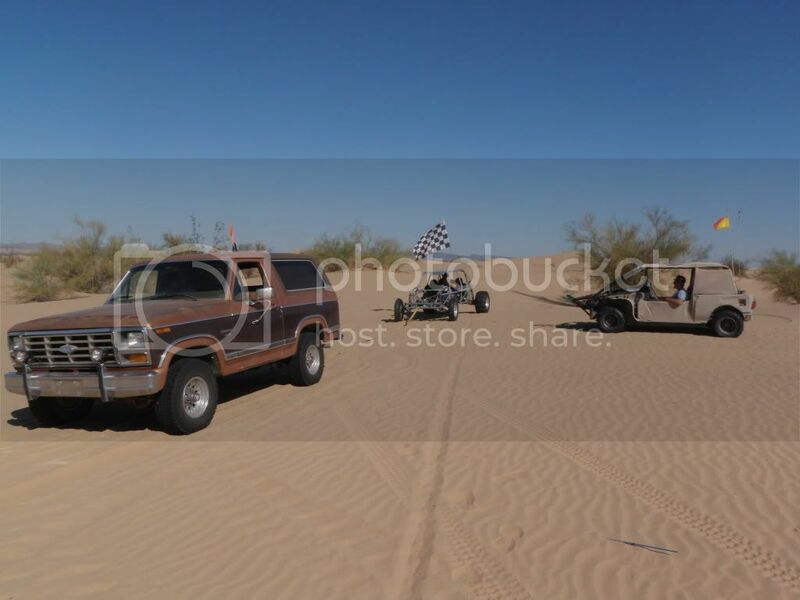 Well as much as I wanted to take the baja to the dunes last weekend, wasn't in the cards. Since I already had the dune pass, I decided to go with just the Bronco and hang out with all my friends. Turns out the bronco is a ton of fun, and far smoother than I figured. On the other hand it won't climb all the way up olds. It did tow lots of stuff out of the sand. hi i live in tampa fl where are you guys getting the cover for the breathers to me they look like bowls ive ask around no one undersand what im talking a bout?